Last updated by suzlipman at May 13, 2017 . Screens! They dominate many of our lives, often to a greater degree than we wish. While many of us parents can attest to the addictive nature of technology, we struggle with ways to reduce it in our children’s lives. It is perhaps a bonus, then, that the wonderful Campaign for a Commercial-Free Childhood has proclaimed May 1-7 to be Screen-Free Week. Sometimes this kind of added incentive is all we need to inspire us to action. More than once, parents have told me that their children’s favorite memories include episodes of family game nights by fire- or candlelight during power outages. You can create your own “power outage” by participating in Screen-Free Week. And, even if you don’t go completely screen-free, you might want to pledge an hour or so a day or night to have some good screen-free fun. Who knows? That fun might just become a habit or your own favorite family memory. Make a Paper Boat and sail it in a creek, pond or bathtub. Make a Bird Feeder. Our local birds have gone nuts for ours and we plan to make more. Make easy Wreaths, Crowns and Baskets to celebrate May Day and spring. Enjoy Loom and Finger Weaving. You can do this anywhere! Keep a Moon Diary as a way of observing the night sky. Slow your pace and have a Cloud Race. Get a jump on summer by making S’Mores. Camp under the stars if it’s warm enough. Bake your own Soft Pretzels. These are really easy and fun. Play a different fun board game every night. We like Boggle, Sorry, Taboo, Pictionary, Scrabble, Mancala, Masterpiece, Monopoly and Hi-Ho Cherry O. Discover The Joy of Quiet. And, if you’re really missing your screen? Make your own Shoebox TV! Cut a large opening for the TV screen into the bottom of the box, leaving an even border of 1” or more all around. Holding the box horizontally, cut two holes on the top, each about 2” the side and 2” back from the cut-out section. Your dowels or cardboard tubes should fit into the holes. Cut two bottom holes that line up with the top ones. Cut the cardboard tubes, if necessary, so that about ½ “ sticks out on the bottom and 1-2” on top. Decide on a story you want to tell that primarily uses pictures. Place the paper horizontally (cutting, if necessary, to fit the tube length) and draw one picture on each page, adding words, if desired. Leave at least 1” on each paper edge and at least 2” on the left edge of the first picture and the right edge of the last picture. Lay the pictures out, left to right, in the order they will appear. Turn them over and, keeping the order, run a piece of tape down each back seam where two pictures come together. Tape each end of the paper story scroll around a tube or dowel and roll on the back sides of the scroll, so that the paper image is at the front of the tubes and the paper is tight and sized to the box. Place the tubes into the holes and place the lid on the back. Decorate the front of the TV, if desired. Gently turn the tubes to make the pictures move. Slow Tip: You can also use images from magazines or comic-books to create your story. You can make multiple story scrolls and change them through the back of the box. In doing so, you’ll join nearly every ancient civilization in telling stories using scrolls, starting with the Egyptians, who created them on papyrus. The Shoebox TV craft is adapted from Fed Up with Frenzy: Slow Parenting in a Fast-Moving World, which contains 300+ more ways to enjoy screen-free family fun. When I speak to families about slowing down and enjoying family time, one of the things that comes up over and over is screen time. Those shiny screens dominate many of our lives, often to a greater degree than we wish. 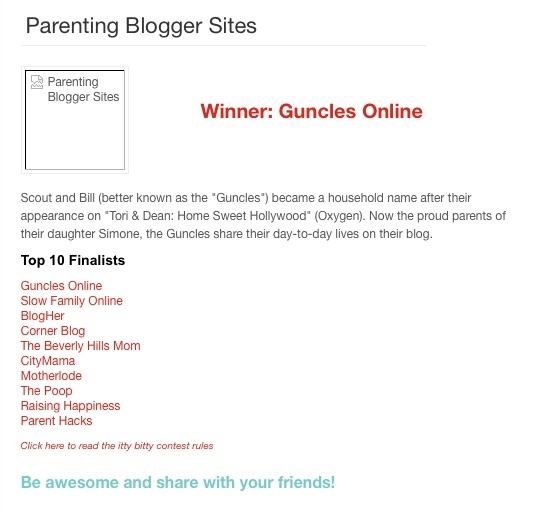 While many of us parents can attest to the addictive nature of technology, we struggle with ways to reduce it in our and our kids’ lives. It is perhaps a bonus, then, that Mar 3-4 (sundown-sundown) is National Day of Unplugging. Sometimes this kind of added incentive is all we need to inspire us to action. More than once, parents have told me that their children’s favorite memories include episodes of family game nights by fire- or candlelight during power outages. You can create your own “power outage” by participating in National Day of Unplugging. Who knows? This might just become a habit or your own favorite family memory. Many parents worry about summer slide, the learning loss that can occur while school is out for the summer. Great news: There is a hotbed of learning right in your own backyard. Science, math, art, history, and early literacy can come alive through the kinds of rich, hands-on, project-based experiences that make learning meaningful, all while you’re having fun exploring outdoors. Small creatures like birds and butterflies are always fun to watch. There are lots of ways to encourage them to visit your garden and linger a while, many of which provide fun and fascinating projects while benefiting your local habitat, your garden and the greater ecosystem of the Earth. You don’t need a large yard to have a habitat garden. Apartment balconies, window ledges, school gardens, and decks can all host local habitat. Backyard creatures essentially need four things: Food, water, shelter and places to lay eggs and care for their young. Learn more and find resources about habitat gardening. Welcoming wildlife needn’t be complicated. One very easy way to start is by making a bird feeder. Want to take it a step farther? The Great Sunflower Project is just one of many opportunities for kids to experience citizen science close to home. Citizen scientists are ordinary people of all ages who help scientists and organizations track the count and behaviors of birds, butterflies, bees and others. After all, researchers can’t be everywhere, and many of us have habitats in our backyards and neighborhoods that can help them gain important information about nature. If you have 15 minutes, you can count bees, which are vital for the Earth’s ecosystem, for The Great Sunflower Project. Other projects available year-round allow you to track birds, bats, butterflies, fireflies, wildflowers, meteors and snow, learning about each in the process. See a list of citizen science projects. You can grow just about everything needed for a pizza right in your own yard and then harvest and eat all the items baked in a pizza. All you’ll need to add is the dough and cheese! Pizza gardens teach design, planning, growing, harvesting, cooking and nutrition. Determine the shape of your pizza garden and decide what you’d like to grown and how you want to divide the space. Round pizza gardens, for instance, can be divided into four, six, or eight spokes, to resemble pizza slices. Mark off areas with string or rocks. Make sure to give plants like tomatoes plenty of room. In addition to tomatoes, try zucchini, eggplant, peppers, spinach, basil, oregano, onions, or garlic. Or grow flowers – red flowers to represent tomato sauce, yellow flowers to represent cheese, pink flowers for pepperoni, and some green leafy plants for spinach or peppers. Why not make gardening into a game, and create a science experiment at the same time, with a seed race? Choose two or more types of seeds. Plant them at the same time, in the same conditions, near each other in the ground or in similar containers, indoors or out. (Or plant the same seeds and vary one or more conditions as an experiment.) Water and watch which one emerges first and grows fastest. Stake them with a store-bought or homemade yardstick to measure their progress. Give your kids something they can claim as their own, and engage them in early literacy at the same time by planting seeds in the shape of a child’s initials. Lay string in the shapes of the letters you like and dig a shallow furrow beside it. Plant your seeds – leafy greens work well for this project because they come up quickly and fill out nicely. These include lettuce, chives, radishes, cress, and various grasses. Most greens have fine seeds, which can be planted in a close, continuous line and thinned as needed. What better way for kids to learn about the process of seeds becoming plants than to collect, save, plant and grow their own seeds? Seed saving is fascinating, rewarding, frugal and fun! Kids love to make music and noise. What better place for that than outdoors? Hang old or recycled pots, pans, tin cans, lids, muffin tins, silverware, measuring cups and other items from tree branches. Group lighter items close together to create wind chimes, or place them farther apart to let kids make music with wooden spoons to experiment with different sounds or learn about the effects of wind. Outdoor time calls for water play, which allows even the youngest children to learn about the properties of water, as it allows things to float, sink, fill, empty, change textures and temperatures, and move at various speeds. Young children will enjoy a mud play area and lots of old cups and kitchen items for filling, scooping and dumping. Others may enjoy filling cups with water and making “magic potions” with food coloring, glitter and small found objects. Or fill a tub of water and make a fine sea-worthy vessel to play with. Raft: Arrange corks in a square or rectangle, with long sides touching each other. Glue the sides of the corks together. Draw a small rectangle (approximately 1 x 4”) on the paper with the ruler and cut it out. Fold the paper in half, so that you have two rectangles approximately 1 x 2”. Draw your country’s flag, or flags from your imagination, on each outer side of the paper. Glue the toothpick into the inner fold on the back side between the two flags, and let the glue dry. Glue the two halves of the paper together to secure the flag. Affix the toothpick flags into one cork or several corks and set the raft in water. Sailboat: Glue corks together, following the instructions for the raft, or simply use a single cork. Draw a triangular sail shape on the paper (approximately 1” long on the side that will be glued to the toothpick. Decorate your sail, if desired. Glue the sail to the toothpick on its 1” side and let the glue dry. Affix the toothpick sail into the cork or cork base and set sail! Elementary and older children will enjoy making a paper boat and sailing it in a nearby body of water, alone or in a race with others. Artists and craftspeople have long been inspired by the garden. Just getting outside with art and craft materials can open a world of wonder and observation. Gardens, in all their color, variety and changing light, offer great subjects, as well as a place to clear the artist’s head. In addition, they often provide a place where one can get messier than inside a house. Bring tempera or finger paints and paper outside, for plein air painting, paint a flower pot that you can plant in, or make a pretty beaded spider web. Bubble blowing may be one of life’s perfect activities. While providing endless possibilities and inexpensive fun, bubbles also illustrate properties of science. Each one is a thin skin of liquid surrounding a gas. The water molecules on their surfaces bond tightly together, because each is made up of two sticky hydrogen atoms and one oxygen one – H2O. More bubble science is explained here. Bubbles can be made using ingredients you have around the house. When the weather’s nice, I often make a bucket of bubble solution and leave it outside with wands and other fun equipment so my daughter and friends can make bubbles whenever they like. It’s always fun and magical to create bubbles and watch them trail in the breeze. Here’s a recipe for giant homemade bubbles and some fun bubble activities. This is a powerful group game that teaches older children about the interconnectedness of living things. We encountered it on a school field trip to a vibrant marsh and have never forgotten it. Players form a circle. The leader asks them to name a plant or animal that lives in the area. When someone names a plant or animal, he or she is handed the end of the ball of string. When someone names another plant or animal, the string is unraveled and handed to that person. The game continues this way until everyone is holding the same piece of string. It can be very dramatic for everyone to realize that they are webbed together. Choose one of the players to illustrate what happens when there is change, such as when a tree burns down or an animal is eaten. Have that person pull his or her piece of string to see its effect on all the others. Slow Tip: If people get stuck on what to say next, go backward or forward in the food and shelter chain. The bird eats a frog, the frog eats an ant, the ant crawls under a tree, the tree provides oxygen for the deer, and so on. Box ovens employ one of the oldest energy sources of all, solar power. But while people have dried food in the sun for centuries, it was French-Swiss scientist Horace de Saussure who harnessed it for cooking. He used glass to trap heat and create convection while his 1700s peers were still burning mirrors. Anything that can be cooked in a regular oven can be cooked in a box oven, though it’s best to stick with recipes that don’t require raw meat or eggs, until you’re proficient. Choose a hot day with full sun. Completely line the box inside and out with foil, shiny side out. Tape only on the outside of the box (to avoid fumes getting in the food.) Choose a flat surface away from flammable objects. Line it with foil. Use the tin cans as “feet” to hold the cookie sheet or cake pan, which serves as the oven tray. Fill the foil tray or pie tins with briquettes, approx. one for every 40 degrees of desired oven temperature, and start. Place the item to be cooked on the oven tray (ideas follow). Slide the briquettes under the oven tray when ready (white). Place the box oven down over the items, using a small rock on the least windy side to lift part of the box off the ground for ventilation. Place butter or margarine in the Dutch oven or pan and melt it in the box oven. Stir brown sugar and pineapples into the melted butter. Pour prepared cake mix over the pineapple mixture. Bake for 25 minutes or more, until the cake is golden brown. Remove from the box oven and invert onto a second pan or cookie sheet. Slow Tip: Want to try some super easy sun cooking? Make sun tea by filling a container with water, adding tea bags, and letting the container steep in the sun. Backyard fun needn’t only happen during the daytime. Nighttime offers lots of opportunities to explore constellations of stars; meteor showers, like August’s Perseids; or phases of the moon. You can’t help but be infused with a sense of wonder, awe, history and mystery while contemplating the cosmos, as countless people, back to the ancient Babylonians, Egyptians, Greeks and others have done before us. With 88 constellations and numerous other stars, the night sky can seem a bit overwhelming. Begin to get to know it by locating a few key constellations and orienting to those. After all, the constellations were themselves created to help the ancients better understand the night sky. The Big Dipper, which is part of a larger constellation, is a great starting point, as it has an identifiable shape and is usually visible over much of the Northern Hemisphere. It appears like a ladle (bowl) and handle. Seeking the North Star, or Polaris? Extend an imaginary line up from the top corner of the ladle that is furthest from the handle. Polaris is in turn on the handle of the Little Dipper, which appears upside down and facing the opposite direction from the Big Dipper. Continue on from the North Star, away from the Big Dipper, for about the same distance and you will reach Casseopeia (the mythical Queen of Ethiopia), another famous constellation. In the Northern Hemisphere, Cassiopeia is shaped like an “M” in the Summer and a “W” in the Winter. Consult a star map and continue to find relationships to these constellations. Slow Snippet: What makes stars twinkle? What we see as twinkling is really the light from the star bending as it moves through layers of the Earth’s atmosphere. That trip takes billions of years, so that what we see is a snapshot of a time in the cosmos that is long past. Taking note of the moon’s phases and rhythms, as it moves through its cycle, is a great way to feel the rhythms of our lives and of nature. Observing the moon and keeping a moon diary can help younger children understand how long a month is. Scavenger hunts are a great way to get everyone exploring and observing in nature. Create a list in advance or have players contribute to one list of 10-20 things they might find in the backyard or park. A list might include an oak tree, a pond, a red bird, a dandelion, a wildflower, a nest, a feather, an acorn or a hollow log. You or the hunters could also list more subjective items, such as something rough, something orange, something unexpected, or a heart-shaped rock. Teams or players go off to seek the items on the list and cross each off when they see it. One point is awarded for each item found. The person or team with the most points wins. This is a fun and easy way to get kids to look around them and observe small items in their own backyards. Tear off a piece of masking tape, slightly larger than the child’s wrist. Place it around the wrist with the sticky side out. Go for a walk or hunt and look for small items in nature that can be stuck to the masking tape, such as leaves, twigs, seeds, acorns and pods. (Generally things that have already fallen on the ground are safe to pick. If in doubt, leave something.) Fill the bracelet by sticking the items onto it and wear it proudly. These activities are adapted from Fed Up with Frenzy: Slow Parenting in a Fast-Moving World, which contains 300+ more fun family activities. Want to take it further? Create your own backyard DIY summer camp with eight weeks of ideas from A Natural Nester and many others. San Francisco Bay Area parents, want to find a camp that inspires summer learning and fun? Check out Galileo Camps, with over 40 Bay Area locations. Use code: 2014INNOVATION for $30 off. This post is part of the School’s Out Top 10 Summer Learning series. Be sure to read all the other great Top 10 lists! Thanks to our sponsor, Galileo Learning. I love anything that let’s you customize your projects, so when I saw these special cookie cutters from Chicago Metallic, I immediately bought the set. They are so much fun to use! There are three generous cookie shapes with grooves to fit the letters, which follow the same principle of old printing presses – letters get placed into the grooves backward, in order to print the messages in the right direction. There was more than enough of every letter. In addition, the set comes with some ready-made strips of common phrases, like Happy, Birthday, Congrats, Holiday, Welcome, From and Love You. I had been wanting to send my college-age daughter a last care package for the year, so I celebrated the end of the school year and the beginning of summer in cookies. I used the recipe that came with the cutters, and it made a simple, thick, buttery sugar cookie that stood up to shipping. I’m sure I’ll experiment with other recipes and sayings, because this was so much fun – and most appreciated. I think they’d make terrific cookies for holidays or any occasion. For children’s birthday parties, you could surprise guests with personalized cookies, as a simple party favor (that will surely be appreciated). For an older group, cookies could serve as placeholders. Posted in Butter and Egg, Home Ec. Cranberries and pears are both such delicious and evocative fall and winter fruits that I was thrilled to find a jam recipe that combined them as wonderfully as this one. It’s sweet, with a little bite, and with its wonderful color, makes a fabulous spread or gift at holiday time or anytime. Making jam is one of my favorite family kitchen projects. It combines science, tradition, and the supreme satisfaction of the entire canning process, which lets you transform fruit into jam, before pleasingly pouring it into glass jars. My simple and delicious recipe for cranberry pear jam requires only four ingredients. It comes from Food in Jars, which is a great source for all things canning. Make it before the cranberries disappear for the season. My family has had the joy of folding and baking soft pretzels in the 150-year-old Sturgis Pretzel Factory in Lititz, Pennsylvania, the oldest commercial pretzel bakery in the U.S. There’s nothing quite like rolling and then shaping the pretzel dough into its classic shape, and then seeing it placed into giant brick ovens on large wooden boards, all in the stone basement of a building that dates back more than 200 years. Pretzels themselves date to 6th century Italy, say the folks at Sturgis, where monks molded them into the shapes of children’s praying arms. Baking pretzels at home offers the same delights – the pleasure of working with dough, the wonderful way it smells when it’s cooking, and of course, that classic soft-pretzel taste. Add the sugar, salt and 2 cups flour and beat until smooth. Stir in remaining flour to form a stiff dough. Turn onto a floured surface and knead about 5 minutes until smooth. Place in a greased bowl, turning once to grease top. Cover with a towel and let rise in a warm place about an hour, until doubled. Punch dough down and divide into 12 portions. Roll each into thin rope (approx. 12”) and loop both halves up and back around to the middle to twist into a pretzel shape. Apply a little pressure to make the ends stick. In a large saucepan, bring water and baking soda to a boil. Place pretzels into boiling water, one at a time, flipping once, for 15 seconds on each side. Remove with a slotted spoon and drain on paper towels. Place on greased baking sheets. Brush with water and sprinkle with salt or cinnamon sugar. Bake for 12-14 minutes or until golden brown. Cool on racks. I’m an early riser by nature, but lately I’ve been getting up especially early. I’m not sure why this is, though changing rhythms of self and season certainly play a part. It really feels like Fall now when the sun doesn’t rise until close to 7 am, and the mornings are fog-bathed, chilly and cozy. Though I relish bustling family time (and I sometimes wish I didn’t begin to yawn extravagantly by 10 pm or even earlier), there is something about being awake and alone in the quiet early morning hours that is extremely special, calm and naturally slow. The knowledge that the whole day is ahead, and one can be present for its entirety, lends a feeling of gratitude and fullness to the early-morning moments, a feeling that can too easily slip away as the day contracts and fills with busy-ness and chores. I recently used an early morning to luxuriously pick up a sewing project – mending a pair of overalls for Anna – and bake biscuits, both of which I knew would surprise the family when they awoke. Like much handwork, running thread through a garment can be an especially calm and purposeful task. Filling the house with the smells of fresh coffee and biscuits tends to make early risers of others, too. When Anna woke up and saw the biscuits, and especially her overalls, I got the biggest hug. Preheat oven to 400. In a food processor (or with a pastry cutter) combine flour, salt, sugar and baking powder. Drop in the butter and process until coarse crumbs form. Pour in the cream and process until just combined – do not overmix. Transfer bowl to floured board and knead 6 turns. Pat or roll dough into a circle about 3/4 inch thick. Using a standard or other cutter, cut out biscuits. Place on lightly greased cookie sheet and back for 10-12 minutes or until golden. As an unabashed enthusiast for all things Halloween, I loved Maggie da Silva‘s very charming and thorough ebook, Real Family Halloween Fun. Maggie is also the author of The Real Family Camping Cookbook, and her flair for providing complete information in a fun and accessible way is again evidenced here. Maggie provides everything you need for a memorable and fun Halloween. There are ideas for lots of different costumes, including last-minute ones, from unicorn to superhero. Thorough guidelines take the reader through every step of throwing a Halloween party, including themed decorations and music, invitation text, traditional and obscure games ranging from fortune telling to Halloween hunts, and fun and unique treats like Witches’ Fingers and Mummy Mealoaf. As a pumpkin lover, I’m “dying” to try the pumpkin cupcakes with cream cheese frosting. Maggie’s holiday spirit is completely infectious. I especially enjoyed her forays into Halloween history and her section on old-fashioned and forgotten Halloween fare, such as Barnbrack and Colcannon from Ireland, and Boxty and Soul Cakes from the U.K. Real Family Halloween Fun is rounded out with crafts, lore and even poetry, which succeeds in putting the reader in the Halloween mood while taking much of the guesswork out of bewitching celebrations of any scale. For more information on downloading, see Real Family Time. It’s the rare person whose imagination isn’t captured by the delight in creating a gingerbread house. There’s the architecture aspect, as the house’s pieces are baked and fitted — and icing-caulked — together in a variety of ways. There’s the decorating, which can be done with all manner of bright candies and objects and patterns that can recall familiar items — or not! And there’s the very satisfying, whimsical, one-of-a-kind structure that results. 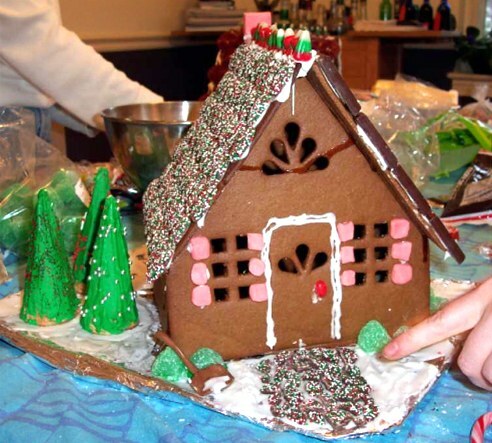 Here are some tips and ideas from around the web for creating gingerbread and other candied houses. From Wilton, comes this extremely informative and creative guide to decorating gingerbread houses that covers multiple styles. Celebrating Christmas offers recipes, ideas, and enough blueprints for homes and landscaping (from ponds to flower-lined paths) to satisfy your inner general contractor. 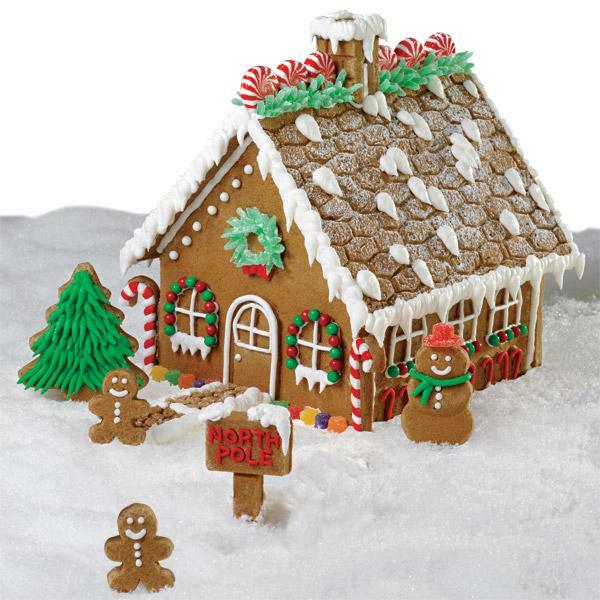 Gingerbread House Heaven is another site with lots of ideas and beautiful pictures for inspiration. Think you can’t light a gingerbread house with real lights, for instance? Think again. This site shares how, in addition to offering instructions for melted-candy windows that will make the light glow realistically through. Roofing textures and various recipes for edible clay are among the many other things covered. If you’re still seeking good gingerbread recipes and building how-tos, Simply Recipes has plenty. Rather skip the headaches of building and just move in? Here are lots of turn-key house ideas, like using milk cartons or other bases, as a way of getting right to the decorating fun. With small children, especially, the easiest and most pleasing thing to do is cover a short milk carton with frosting and let them stick on candies and other foods to decorate. The milk carton (or a village of them) can sit atop a piece of foil-covered cardboard that can also be frosted. 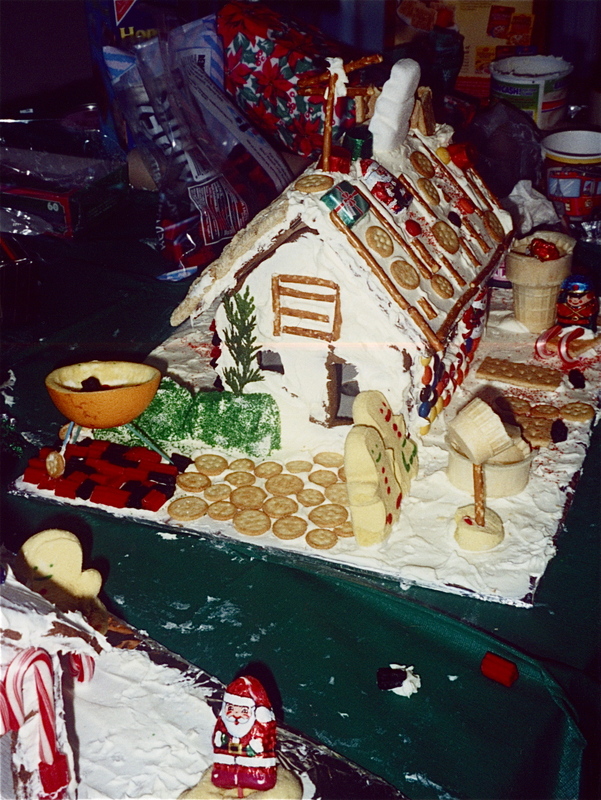 And, of course, you can buy a pre-assembled gingerbread house and get right to the decorating. And, for the modern home, orange-half barbecues and ice-cream cone satellite dishes! Here’s hoping you enjoy a fun and creative holiday! 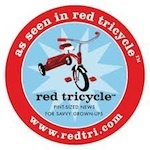 I love this video, which Kari Svenneby of Toronto, Canada’s Active Kids Club posted on the Children & Nature Network forum. Kari is an enthusiastic mushroom forager, harvester and cook, in addition to pioneering a very active outdoor play group and web resource for others. Her and her family’s joy in nature is evident in this beautiful video. Thanks for sharing, Kari!